The Hayti Heritage Center is home to a lot of things: art exhibits, dance classes, concerts, documentary screenings and lectures. But it’s also home to one other type of program Durham residents might be less familiar with: poetry slams. The Hayti Heritage Center hosts its own poetry slam each month, called the Jambalaya Soul Slam, which provides a venue for spoken word artists to perform and compete. In January the center added another initiative – the Jambalaya Soul Slam Academy, where experienced artists lead exercises to help other poets bring their work to life. “The hope is to kind of build confidence and help people to feel comfortable sharing their work on stage,” said Dasan Ahanu, who organized both the slams and the workshops. Poetry slams are a type of spoken word competition with strict rules and guidelines. Performers speak original poetry from memory and are usually energetic and emotionally charged. The performance order is drawn randomly, judges are picked from the audience and performers face a penalty for going over their time limit. Ahanu is the artist-in-residence at both the Hayti Heritage Center and St. Augustine’s College in Raleigh. 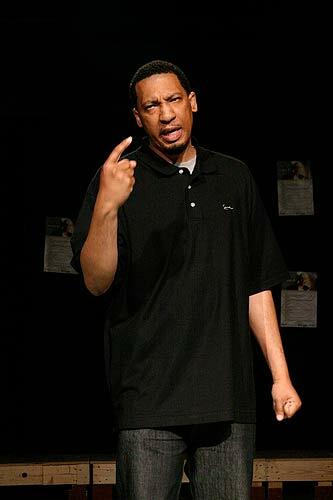 He said the poetry slams started when he collaborated with the center for a hip-hop and spoken word event in 2005. When leaders at the center said they wanted to do more with poetry, Dasan – who was competing then at the national level with a slam team in Charlotte – suggested they host a slam. Since then, the Hayti Heritage Center has been hosting monthly slams for adults. Poets compete at these events for a spot on Bull City Slam, the team the center sponsors to compete nationally. In addition to the adult slam sessions and workshops, there is also a youth component. Ahanu partnered with the Sacrificial Poets, a Triangle-area youth poetry organization, who will participate in the slam workshops and offer lessons for teenage poets. “Starting next month with National Poetry Month, at the next academy we’ll be running joint workshops together,” Ahanu said. The Sacrificial Poets grew from an open mic night facilitated by CJ Suitt, a Chapel Hill poet. What started as an informal open mic night grew into a cohesive performance group that now competes at the national level each year in the Brave New Voices international youth poetry slam festival and also offers workshops at area high schools. “I think it’s one of the very few youth groups going on in the area that’s both conscious and entertaining,” Suitt said. Kane Smego, the artistic director and one of the coaches for the Sacrificial Poets, said poetry, not just the slam form, is a powerful tool for young peoples’ self-expression. Suitt agreed and acknowledged that the slam rules and competitions are what draw people in, but the poetry, the stories that are shared, and the connections that are made are what are most important. He said he thinks high school can be a judgmental, superficial place, and he thinks these slam sessions give kids an important opportunity to be heard. It is moving to stand in front of an audience you know wants to listen to you, he said. The next Jambalaya Soul Slam Academy will be the morning of April 17 at the Hayti Heritage Center. There will also be a poetry slam that evening. The Sacrificial Poets are hosting their own slam, a qualifier for their final slam, this Saturday at the Teen Center in Chapel Hill. Email sacrificialpoets@gmail.com for more information. how do i get involved? i saw Mr. Ahanu at the performance of What is a Hero. i am interested. very interested. please get back at me.